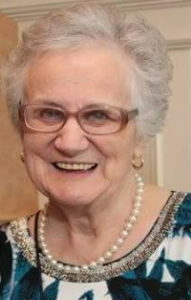 Emogene (Jean) Foley (nee Keck) 88 originally from Punxsutawney PA, passed away on September 21, 2018. A long time Staten Island resident, she resided in NJ for the past three years. Jean worked as a bookkeeper prior to becoming a full time homemaker after her children were born. She was preceded in death by her husband the late Robert Foley and son Kenneth. She is survived by her children Robert Jr. Patricia, and Stephen. Jean was the Grandmother of Rebecca, Dayna, Laura, James, Caitlin, Regina, Diana, Stephanie, Matthew and Meaghan. She was also the loving Great-Grandmother of Sebastian, Dylan, Keegan, Jack, and Colton. She is also survived by many nieces and nephews. Jean touched the lives of many people and will be missed by all. Funeral Services will be held at, Cherubini McInerney Funeral Home, 1289 Forest Avenue, Staten Island, NY. Viewing will be held on Tuesday, September 25 from 4 – 8p.m. Service will be held on Wednesday September 26 11:00am at Cherubini McInerney Funeral Home. Interment is in Oceanview Cemetery. In Lieu of flowers, donations to the American Red Cross or a donation in her name for the next blood drive in your area would be greatly appreciated. To the Stockert Family and all Emo’s relatives and friends. We send our deepest condolences. She was a wonderful, kind and caring woman, it was our pleasure to meet her. May she rest in peace with her beloved hubby and Ken. A sweet Lady. Full of love for her family. I’ll remember her soft words and sweet giggle. Hope your memories will get you through this sad time. My deepest and heartfelt sympathy to you on your loss of your dear mother. I always enjoyed seeing her and speaking to her when I visited you at your house. She was a lovely lady who always smiled and laughed at my jokes. May you know she will always be your Guardian Angel protecting you and watching over you. May G-d give you strength during this difficult time. Aunt Jean always put everyone else first, always sure that you had enough to eat when you were at her house. I loved her laugh and she loved her family! Know that she is in Heaven now — probably making sure that everyone is taken care of and catching up with all the family that passed on before her.